The Tag Heuer Formula 1 CAH1213.BAO863 is sport and luxury combined. Tag Heuer Formula 1 watches are known for their precise movement, high quality and attention to detail. They’re luxury men’s watches, rooted in racing sports. But wait–Tag Heuer also makes women’s Formula 1 watches. They’re just as luxurious and well-made, but with a feminine detailing. This Tag Heuer Formula 1 CAH1213.BAO863 women’s watch is an eyeful. It’s band is made of polished steel and white ceramic. The diamond-encrusted bezel rotates counterclockwise, and two subdials advertise this truly Formula 1 watch that’s been refined for her. You will also appreciate the double safety clasp and diamonds studding each numeral. Price: $2,700. This is a new model, and I was only able to find it for less on watchclick.com for $1,798. It probably goes without saying that trying it on in person is better than ordering online. Nordstrom carries Tag Heuer watches; you can start your shopping there and try on the various models. There are other women’s Tag Heuer Formula 1’s to choose from, but I think this is my favorite. The white ceramic and diamonds are fashionable feminine details, making it unmistakable from a man’s watch. The type of woman who would wear this watch is bold, adventurous, and loves speed, either literally or theoretically (or maybe both!). She is probably a sports fan and loves to play more than one sport. I envision a woman who snowboards in the winter and runs and surfs in the summer. But you do not have to be athletic to own this watch. You can simply love how it looks and want a precise, durable and beautiful watch to wear. 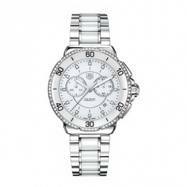 Many women’s watches today are silver with a round dial, so you have hundreds of models out there to choose from. Those who choose a Tag Heuer Formula 1 admire its precision and fine workmanship, the brand’s stellar reputation, and the undisputed good looks and sport style of this watch. If you can identify with numbers 1 or 2, keep searching; this isn’t your dream watch. But if #3 is you, perhaps you should browse the Tag Heuer website for other varieties of the Formula 1–there are models without those details. The Tag Heuer Formula 1 CAH1213.BAO863 women’s watch is a lot of watch to handle (and afford). But like all Tag Heuers, it will last a lifetime, maybe longer.